Staycations in Downtown no longer cutting the mustard when you’re seeking an escape? 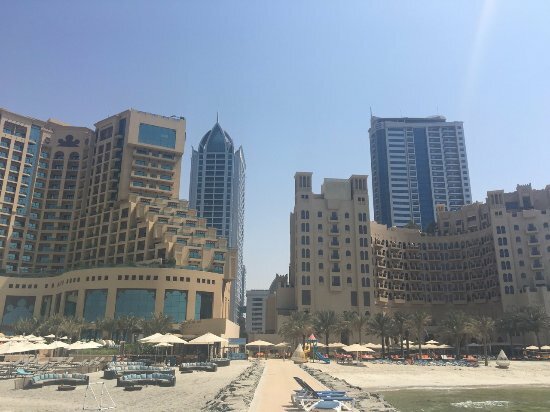 Ajman – though it’s the emirate I always forget (Umm al Quwain has Barracuda and the rest are pretty self-explanatory) – is only 45 minutes away, but may as well be a world away from the marina. And this is why Bahi Ajman Palace Hotel should absolutely be on your radar. Being situated next to the Fairmont would usually be cause for concern for a 5-star hotel wanting to stand on their own, but Bahi Ajman certainly has nothing to worry about here. If you didn’t know which was which already, you’d get confused between the two – so alike they are. But walking in to BA, you certainly don’t feel as though you’re just stepping foot inside another institutionalised 5-star resort. The staff are warm and friendly, the welcomes genuine and the check-in process an absolute breeze. You may look out your window quizzically as you drive through Ajman to the hotel – as there doesn’t seem to be much on the way in that suggests a 5-star escape is waiting for you 700m down the road – but after the bright lights and ostentatiousness of Dubai, we welcomed the authenticity of this area. As far as beach resorts go, this is less beach than resort – due in no small part to the Fairmont seeming to have laid claim to the majority of the sand along this stretch of road. However, BA manages to do a relatively small stretch of soft, white sand really quite well. There are plenty of sun loungers under the protection of gigantic umbrellas on a spacious plot of grass (though you’ll want to be quick to lay claim to them. Our advice? Chuck a towel down before breakfast) and even cabanas steps to the waters lapping edge. The water is warm and clear, the outlook down the coast is stunning, and the sunsets from your balcony are spectacular. I’m not speaking in hyperbole here when I say Bahi Ajman has some of the best hotel staff I’ve ever come across. From the general manager who happened to be around and greeted us at check-in, to the lovely man who greeted us with drinks upon arrival, to the friendly cleaners who greeted us cheerily every time we passed – we quickly felt at home. However, because the way to our hearts is through our stomachs, my favourite interaction was with F&B manager Mr Ghazi, who was so passionate about his culinary offerings that it seemed rude not to completely gorge ourselves at every waking moment. Further to that last point, the food here is a solid offering considering there is just one restaurant onside. The all-day dining puts on a hearty buffet on a Friday night – but forget your standard international dining affair. Instead, you’ll find mushroom moutabal, avocado fattoush and even lamb ouzi – a dish usually reserved for Ramadan. But that’s the way it’s supposed to be, Mr Ghazi tells us, saying the whole spread is modelled on a traditional iftar meal year-round. The grill is particularly good – as is the so-fresh-it’s-still-warm bread (I’m a simpleton, okay). The breakfast is along the same vein – a buffet, but a buffet done right – with plenty of options for everyone. Look out for the banana brioche and the monstrous omelettes. Dining beside the pool, as the crescent-shaped hotel envelopes you on either side is rather tranquil, too. There is a mosque right beside the hotel, which essentially borders on one of its side – which just so happened to be the side we were staying on. This meant a surprising wake-up at 4.30am as the call to prayer cut right through our room. However, this is one unintended wake-up call we didn’t mind as there’s absolutely nothing that can be done to avoid it and we drifted straight back to sleep afterwards. Road and bar noise weren’t a problem at all. This hotel seems more family orientated than many other high-end hotels we’ve stayed at, so it’s definitely one where you are free to bring the kids along. The gym puts most hotel gyms to shame – with an expansive array of brand-new equipment, and the jacuzzi in the spa and swanky Turkish-style showers are a nice touch. My advice? Forgo the big chains and stay somewhere nice, but with more of a homely feel like this place.